The folks at Barringer Construction are storytellers. They build most any kind of commercial space, and every space has a story to tell that’s as important as their own. The Charlotte-based general contractor with nearly 100 employees began in 2011 with the partnership of three men who worked together at R.T. Dooley. After that company was acquired by Balfour Beatty, the trio set out to fill a niche in the market for a regional builder focused on the team, its core customers and the community. In a nod to their time together at R.T. Dooley, Barringer Construction takes its name from the street address of the former firm. A wall-size photo of R.T. Dooley founder Tom Dooley refereeing the 1981 NFL Super Bowl dons one wall. The idea behind Barringer was to simplify the business and blow up some of the old ways of the construction industry, which in the past meant office employees held a separate holiday party than the guys on the job sites. At Barringer, no one has titles, and the names of founding partners Chris Butlak, Tim Miller and Chris Frye are nowhere to be found on the company website. Instead, there are pictures of a fun-loving staff raising money for charity and enjoying each other’s company. And then there’s the work — refined uptown office interiors, churches, schools, medical offices and restaurants. In 2015, Barringer converted an old office-warehouse in South End into a new, 10,000-square-foot headquarters on Old Pineville Road. Barringer just completed its third addition to the space as the construction industry booms. “We’re competing with the large firms and needed a space that would attract talent,” Butlak says. 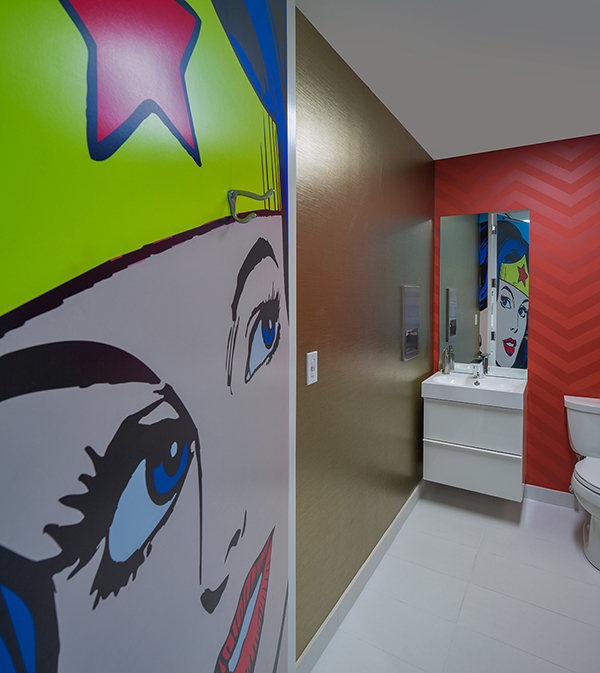 The space is fun, with a mosaic of bathroom tile depicting a Pac-Man game and oversized wall graphics of Spider-Man and Wonder Woman. Craft beer is on tap in the centrally located kitchen and lounge at the heart of the building. As a testament to being stewards of the community and of sustainability, the building is LEED Silver certified and located on Charlotte’s Lynx light-rail line, making travel to uptown clients quick and eco-friendly. Inside the lobby, there’s a combination of old and new materials, from polished concrete offset with timbers from a dilapidated Virginia barn converted to a rustic ceiling accent. “The barn timbers are a statement that we are craftsmen and we can do this, and we also have a story to tell around it,” says Scott MacMeekin, an associate in Gensler’s Charlotte office. Barringer takes that message of being creative, resourceful and understanding clients’ needs throughout the building. The sleek, wooden conference boardroom table belies its humble materials, crafted from $140 worth of framing lumber. There’s no separation between those working in the field and those in the office, and the headquarters space makes that unity clear. The field crews’ lockers are near the reception desk and break area, ensuring there’s plenty of interaction between team members. The offices on Old Pineville Road are a vessel to hold all those stories and a place to build new stories. The space won a North Carolina AIA Merit Award.